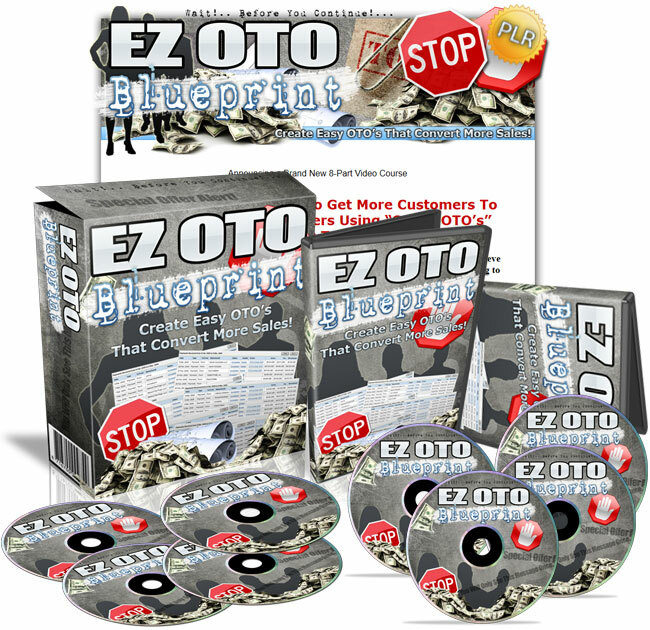 EZ OTO Blueprint - Create Easy One Time Offers That Convert More Sales! Finally, Discover How Easy It Is To Get More Customers To Buy Your One-Time Offers Using The Power Of "Smart OTO's"... Starting Today! This video course will take you by the hand to help you achieve more sales without spending days or weeks banging your head against the wall trying to figure things out on your own! One-time offers aren't anything new. In fact, you've almost definitely seen fast food restaurants use them to increase the size of your initial order. The type of one-time offers we're talking about today is presented only after someone makes a purchase. They've bought your first product. But here's the reality and why most people are failing to get their one-time offers to convert. For almost a decade, we've seen business owners set up one-time offers that don't convert. You know you need to make a change, but perhaps you don't know what it is. This Step-By-Step Video Series Shows You How To Create Smart One-Time Offers That Convert More Sales! You're going to get a quick introduction to the video course itself so you know exactly what to expect. Plus, we will talk about the things that you will need before you get started. Now that you have an idea of what this video course is all about, let's look at why you must have one-time offers. We don't want to leave anyone out, so if you're new to this type of concept, we want to make sure you understand why having a one-time offer in your funnel is crucial to doubling or even quadrupling your overall sales. Before we can jump in and start mapping out your one-time offers, you need to understand why most aren't converting. Understanding this will allow you to get a better perspective of why your own OTO's may not be converting. Otherwise you're just blindly guessing, and we want you to be successful. At this point in time you will understand why your OTO isn't converting, so now it's time to show you how to set up ones that do convert. Here we want you to start brainstorming how you can implement this strategy into your own funnel to ensure that you give your customers what they want. When it comes to creating a funnel with smart OTOs, it's easy to do once you have gone through videos 1-4. In this video, we'll be mapping out a generic funnel with Smart OTOs by using a flow chart visual map, so you can see how all the pieces of the puzzle fit together. Now that we've covered how to create a funnel and what it looks like to map it out, let's talk about some real-life examples. Because products and services can be drastically different, and we want to ensure that you understand how to implement this inside of your business, in this video we will talk about how to create Smart OTO's for products. We've covered how to create a funnel and what it looks like to map it out, so let’s talk about some real-life examples to ensure that whatever your product or service, you'll be able to implement it in your business. To ensure that you can use everything you have learned, we will cover shopping cart systems that will help you achieve this goal and set up the one-time offers properly via some automated systems, so you can sell your front-end offer and as many one-time offers as you have. Grab This PLR Video Series Now And Learn How To Create Smart One-Time Offers That Convert More Sales! So you can easily increase your conversion rates throughout your entire sales funnel, and finally see the success you've always wanted to achieve! P.P.S. Have you tried other one time offer blueprints and had no success? Unless you take drastic action right now, nothing is ever going to change. Don't wait any longer!